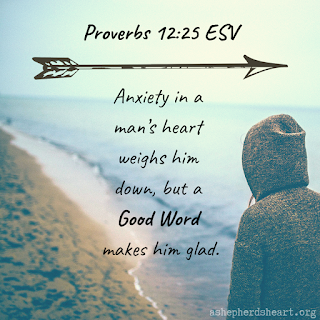 A Shepherd's Heart: Wisdom For Anxiety and Depression from God's Word. 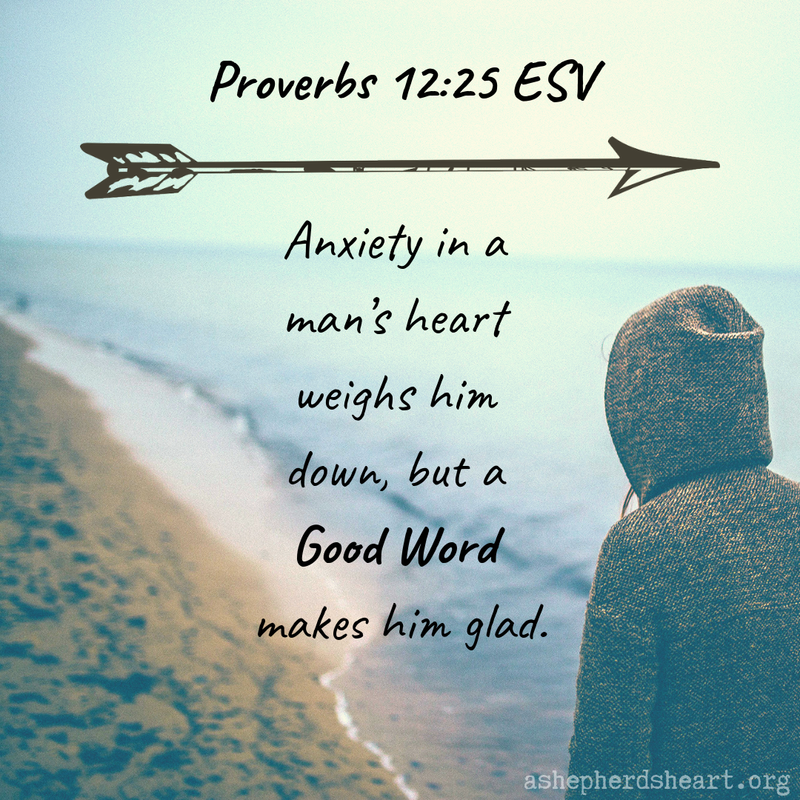 Wisdom For Anxiety and Depression from God's Word. Anxiety and depression are definitely a battle that can wage war for our minds and hearts. It can be crippling sometimes and we need to remember that it's not a battle we can face alone. We need God, His Word, His Holy Spirit, and His people to overcome any anxiety, depression or anything. When He says cast all your anxiety upon Him because He cares for you, (See 1 Peter 5:7) He means it. When He says come to Him all who are weary and heavy laden, and He will give you rest, (See Matthew 11:28-30) He means it. But the question remains...do we actually do these things are do we try to carry these burdens alone? I heard a good and eye opening thought recently from Pastor Louie Giglio about things such as anxiety and depression which has made me evaluate my own battle with depression. I find what Pastor Giglio says to be true and no matter what you and I face, we need The Lord's help to evaluate what is the root cause of our anxiety, depression or anything else. Speaking from my own experience and witnessing the experience of others, while our anxiety or depression may want drive us to run from God and His Word, as follower's of Christ we need to learn to train ourselves to run to God and His Word as He is The ultimate, help, strength, healer and more that we need to over come these times. We all need to speak the truth of His Word ourselves no matter how loud the opposing voices scream otherwise. Are you anxious? Speak the truth of God's Word to yourself. Is a believing friend anxious? Speak the encouragement and truth of God's Word to them. God is The Great Physician and His Word brings light to the all the dark places, even in our times of anxiety and depression! So, pray, seek God's Word, and then speak a good Word, His Good Word to yourself and others! P.S. While I'm seeking to encourage you from God's Word about this topic, if you are facing times of anxiety and depression, I want to encourage you that besides God's Word and prayer, that you should also consider seeking counseling for this, especially if it persists. There's wisdom in seeking counseling and there's nothing you should feel ashamed of in seeking help from others. So, get help through your local church, Christian Counselors, Biblical Counselors or other types of counseling as you're not meant to battle this alone!